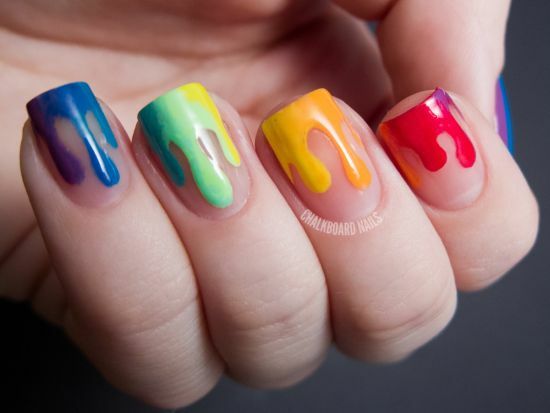 If putting different colors on the nails is your kind of stuff, here is dedicating today’s post that showcases 40 rainbow nail art ideas that would help you dab on as many shades as you wish on your pretty manicured nails. 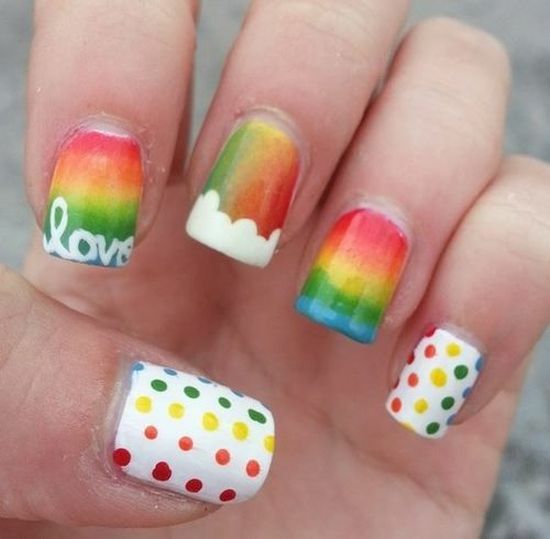 For such girls that don’t like simple nail art ideas must see what I have enlisted below as all these images relate to the most gorgeous rainbow nail designs – designs that will make you feel beautiful and quite like a diva! 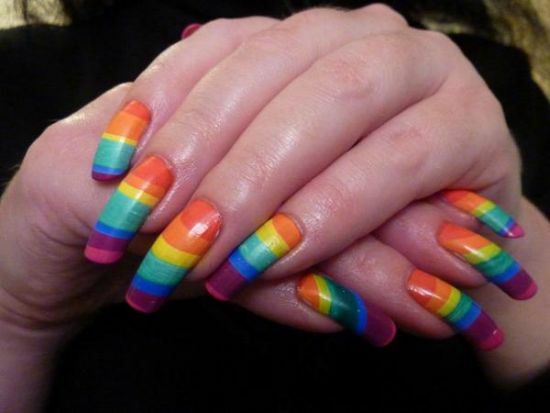 Rainbow nails look pretty and suit almost any age group provided they are done up in the right possible way. 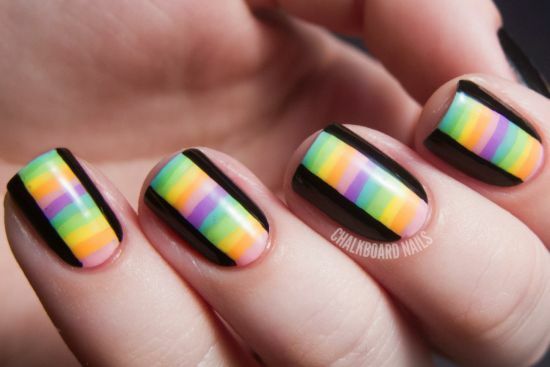 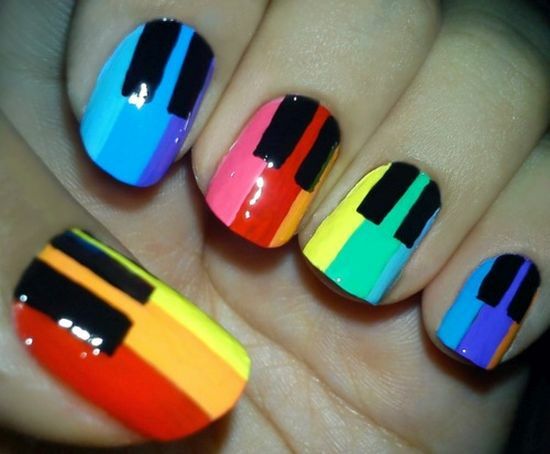 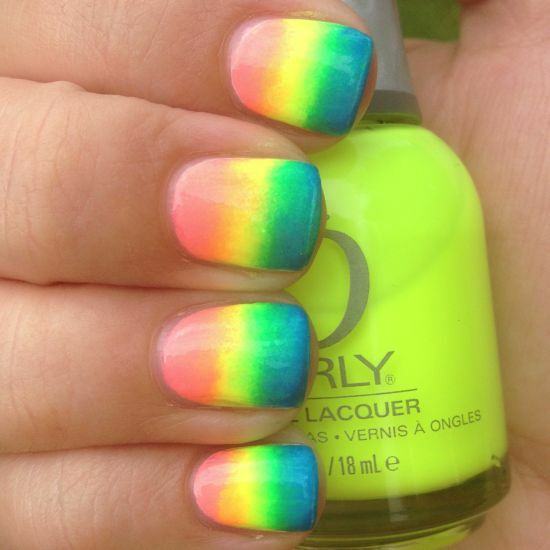 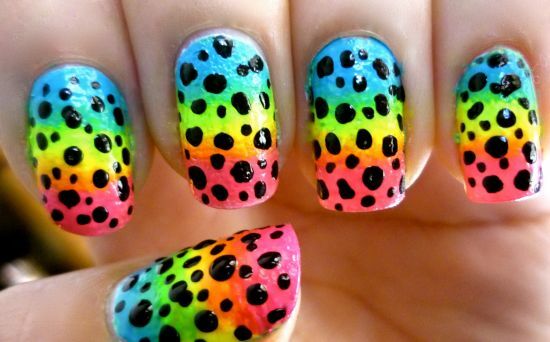 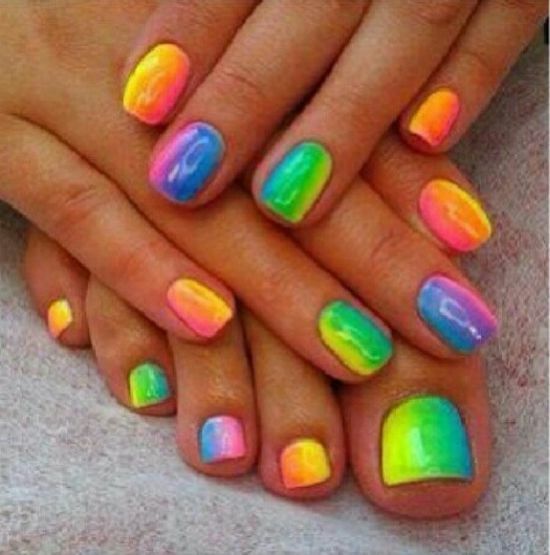 For such rainbow nails, gals need to be sure of the color combos they want to present on their nails. 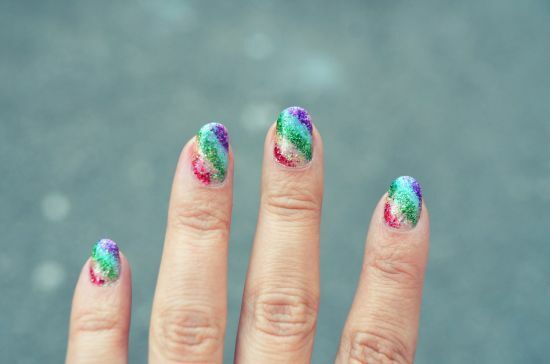 Many of us ladies are crazy fans of the fabulous French manicure and what better way than to compliment its beauty by adorning the nails with rainbow nail polish to add luster and sheen! 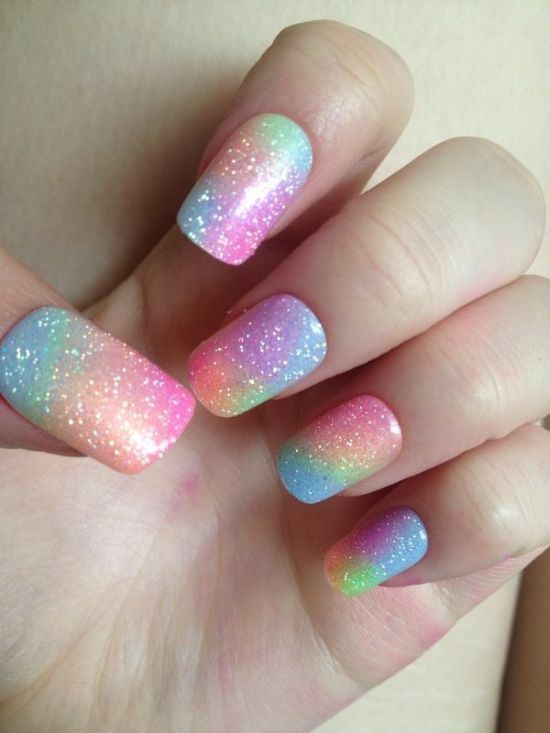 When I conjure up an image of a beautifully rainbow designed nail, many different major color patterns come up instantly to gratify my senses and believe me, these always manage to take my breathy away, with their brilliant shimmer and sometimes, with a plain pastel look. 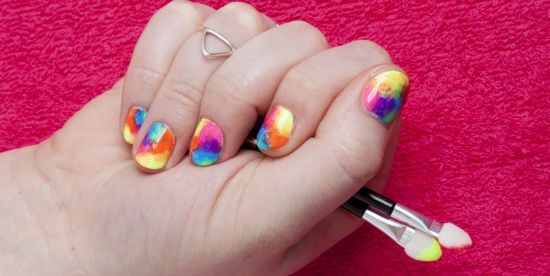 Yes, rainbow patterned nails come in different designs, one of which is simple with easy breezy nail polishes of baby pink and other pastel colors. 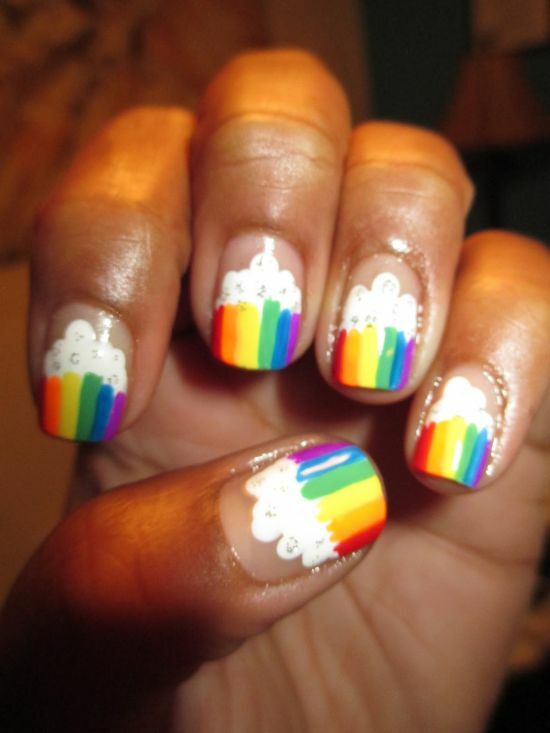 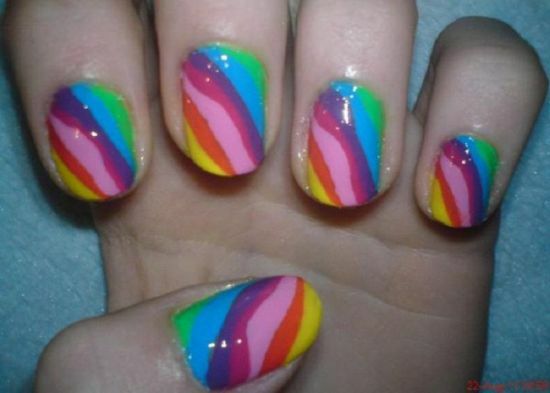 There are ladies that want to have rainbow designs on their nails but prefer to keep them simple. 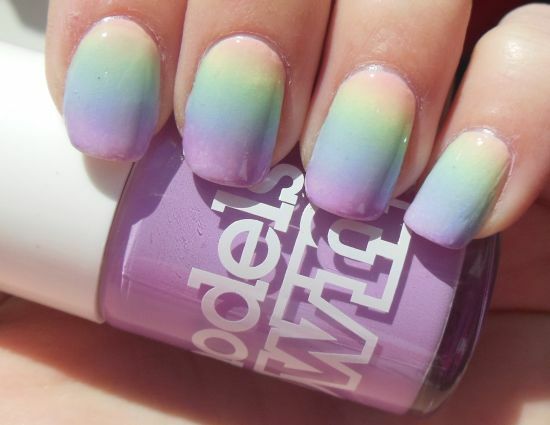 For such women, pastel look is the best as you can see in some of the images I have put below. 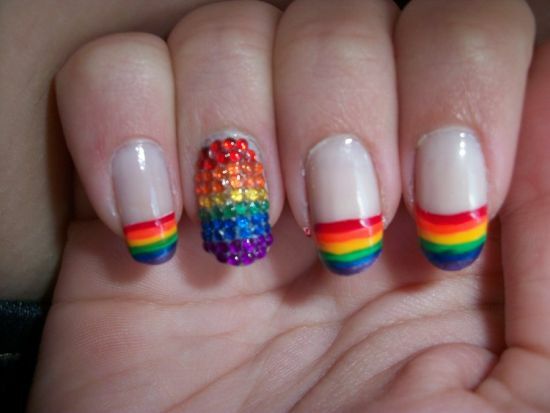 There are other rainbow nail art ideas that allow the usage of vibrant colors and accessories like stones and glitter to make an electrifying style statement. 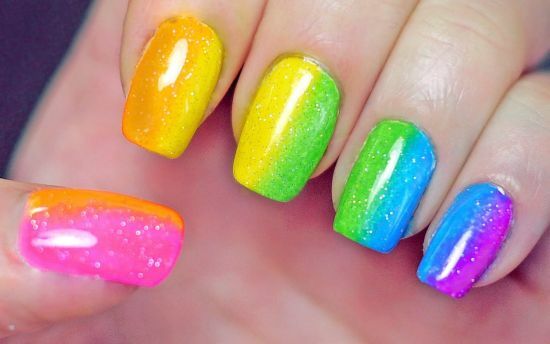 The use of glitter is common when designing your nails with rainbow nail polish like red, green, blue and other colors. 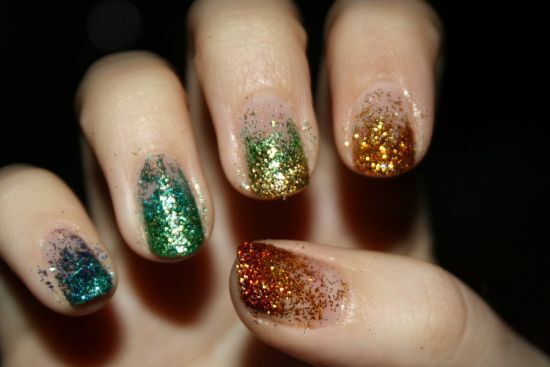 Glitter adds sheen and make your nails dazzle. 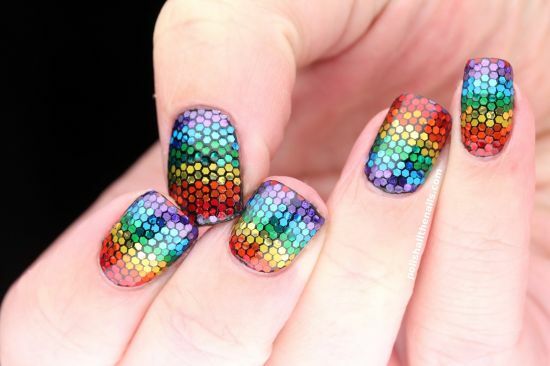 These glittery nails are quite a hit with young gals that want to appear like celebs. 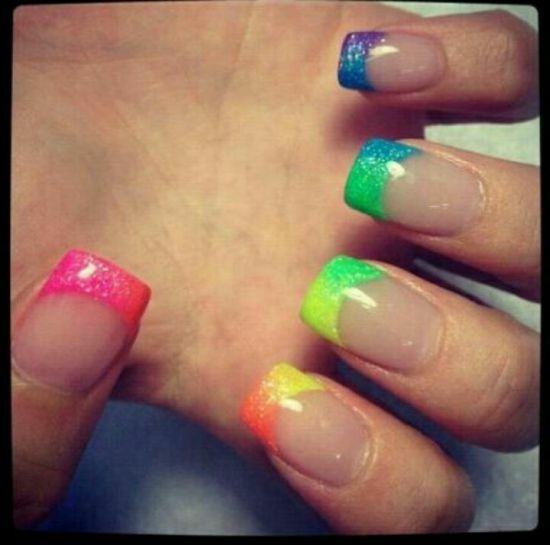 Neons too are in vogue with every second lady flaunting perfectly manicured nails with rainbow nail designs. 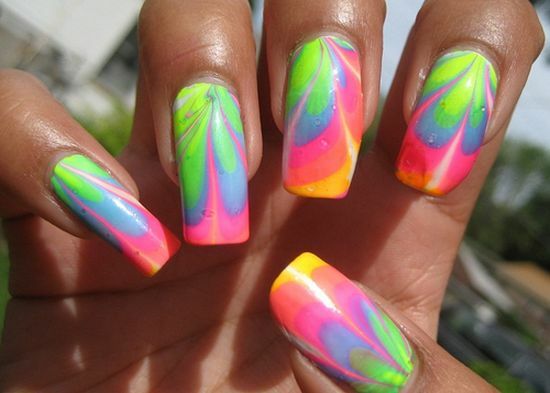 Neon shades like electric green and yellow look fabulous and are suitable to be worn in any season of the year, especially spring time. 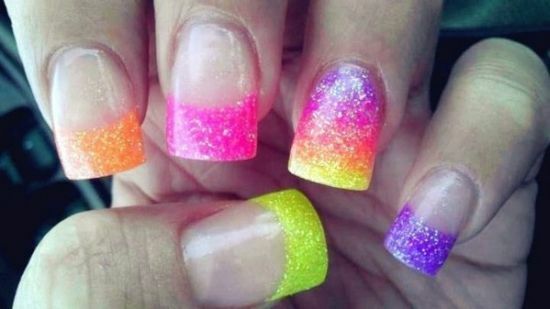 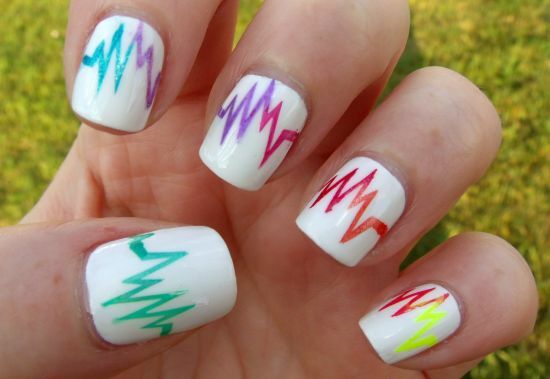 There are photos below that will show you how beautiful one’s nails can look with neon shades. 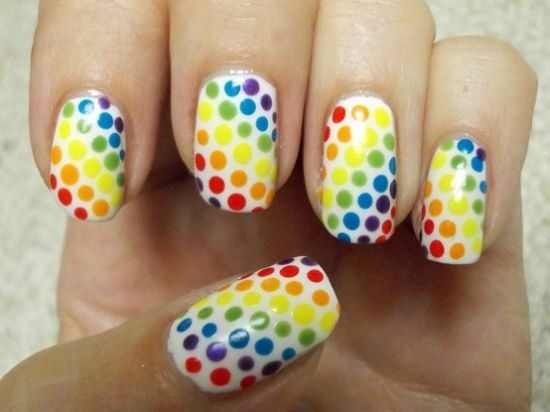 Polka dots and stripes too are much adored by pretty young ladies as these are always the flavor of any fashion event and we know that gals like to follow fashion! 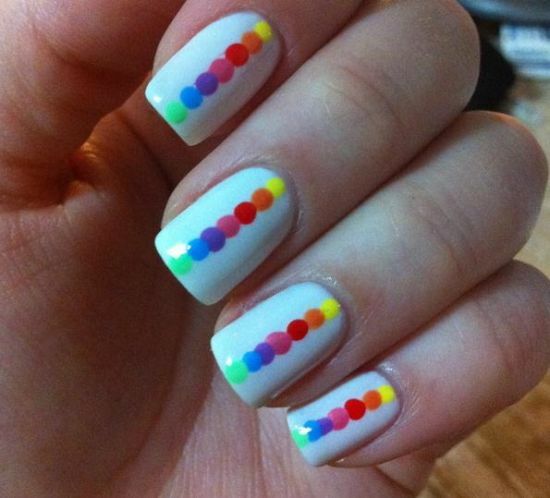 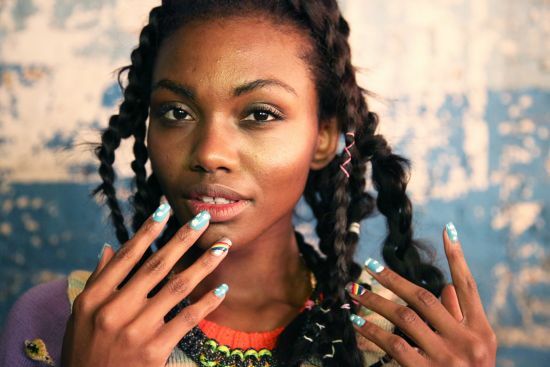 Dots and stripes add a special touch to your rainbow nails. 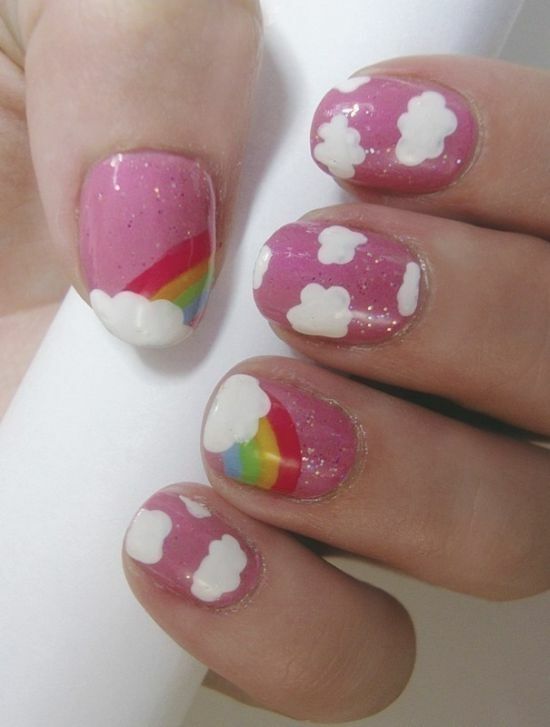 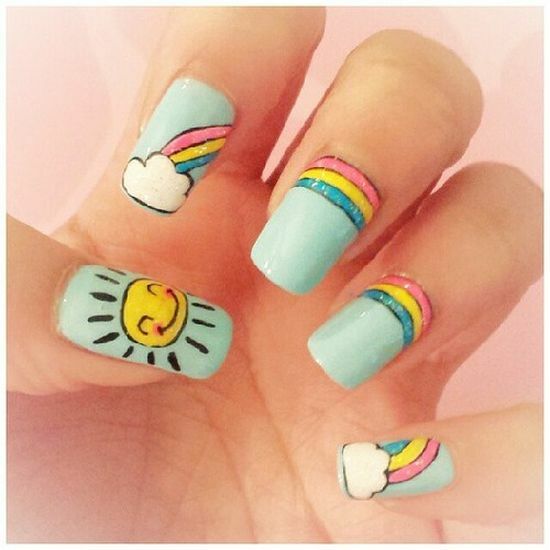 Being an avid fan of rainbow pattered nails, I have put forth some pictures where nails have been painted with bright rainbow nail designs that involve white puffy clouds. 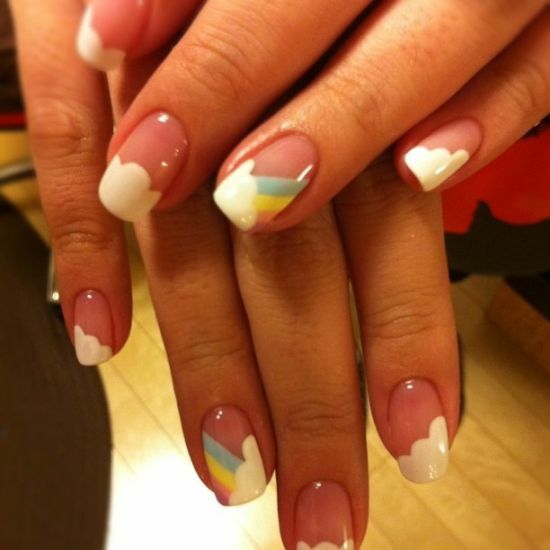 The design looks amazing and cute. 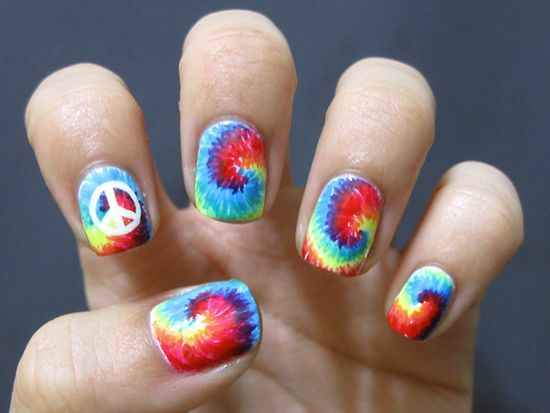 There are tie and dye rainbow designs too that look pretty neat on anyone. 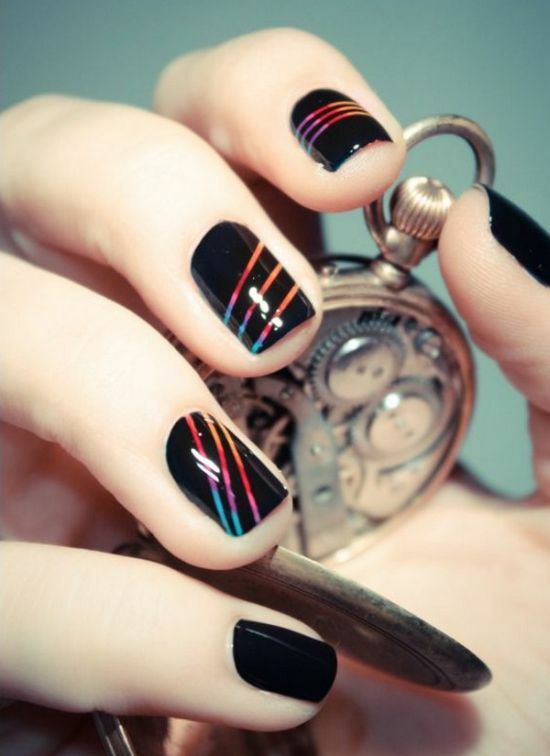 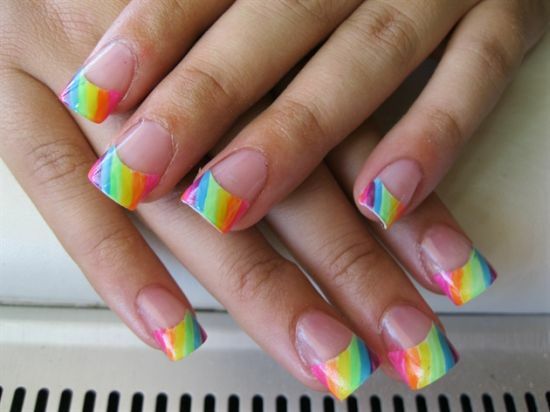 Nails with their tips painted with rainbow colors too look awesome and are suitable for any occasion. 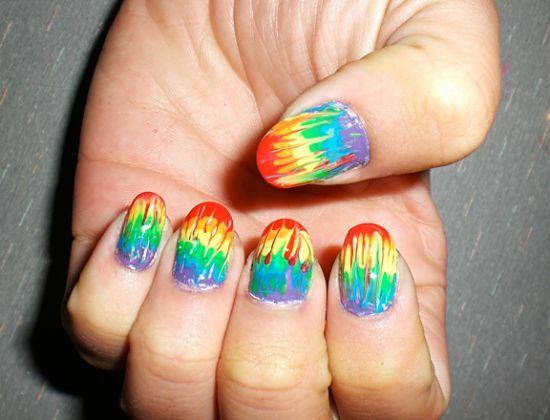 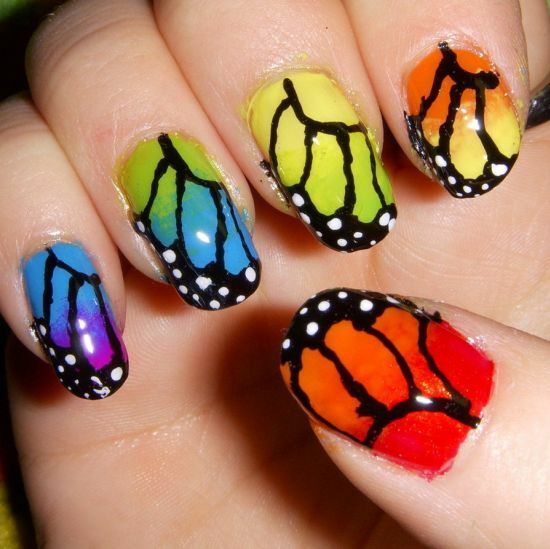 Similarly, painting half your nails with glitter and rainbow shades too makes for a stylish nail art. 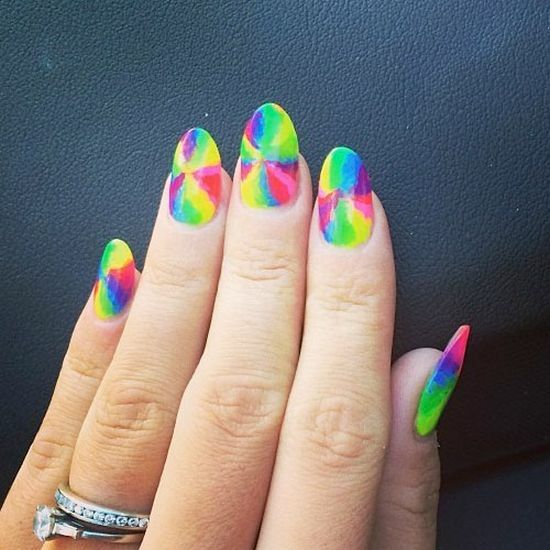 Other rainbow designs include motifs of flowers and swirls to make them suitable to be worn for any festive occasion. 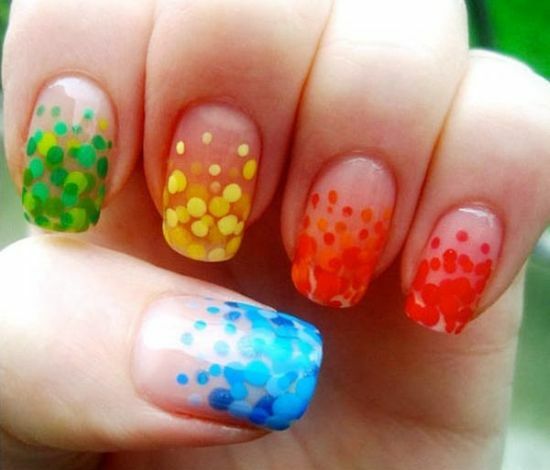 After having gone through the list, am sure you ladies must be itching to get one of these cuties painted on your nails. 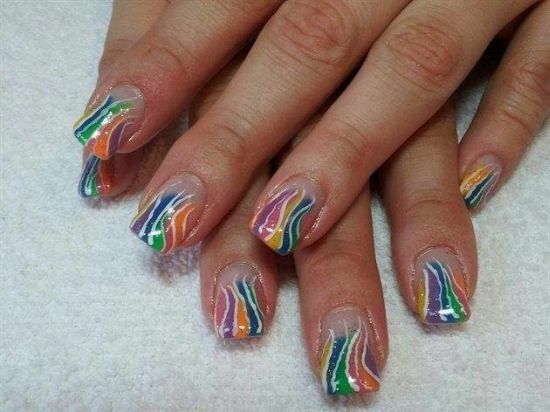 I am hoping to get some comments on today’s post to see if these rainbow designs made an impression on you. 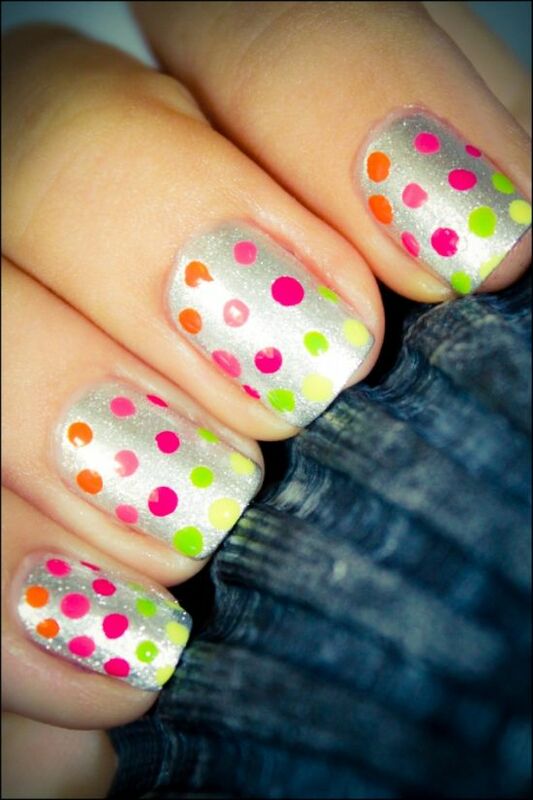 Check out the images and get going!